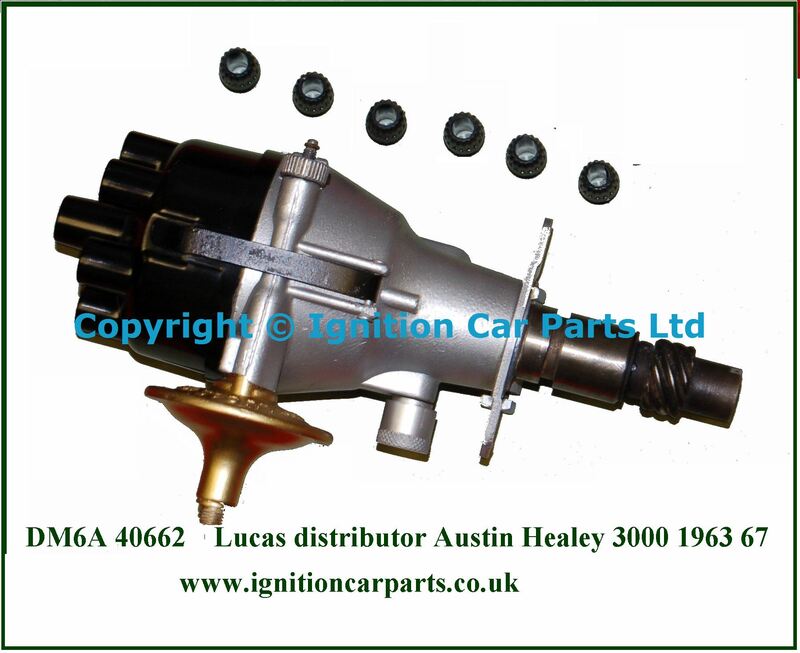 - For Lucas 45D6 Distributors this easy to fit system can transform any classic into a reliable everyday mode of transport. 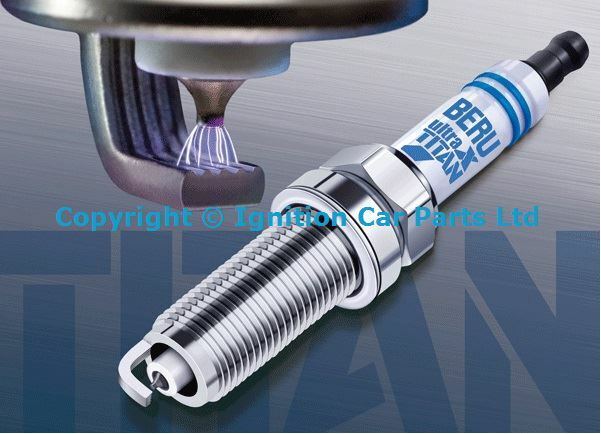 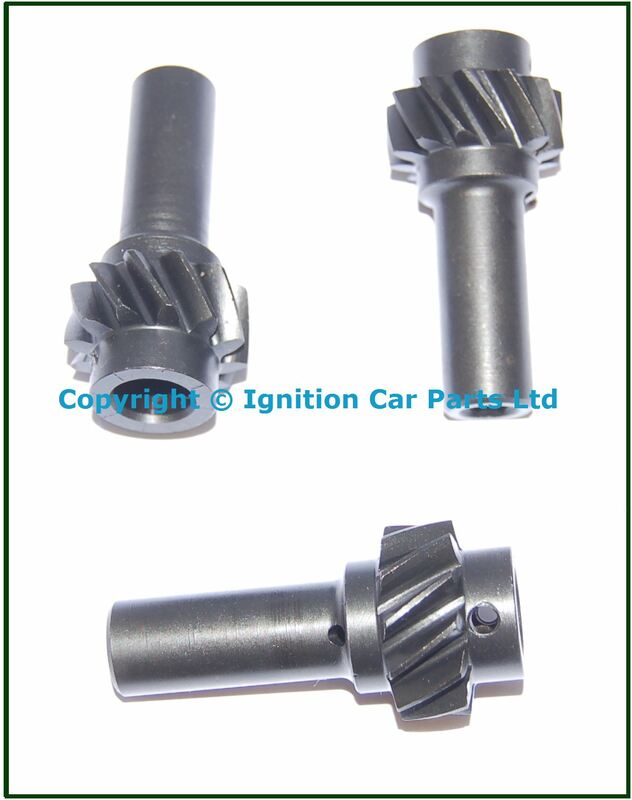 Not affected by damp conditions, better fuel Economy, better starting. 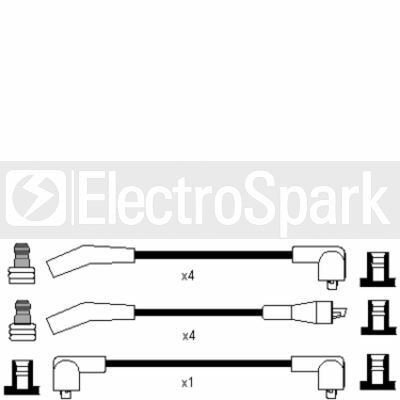 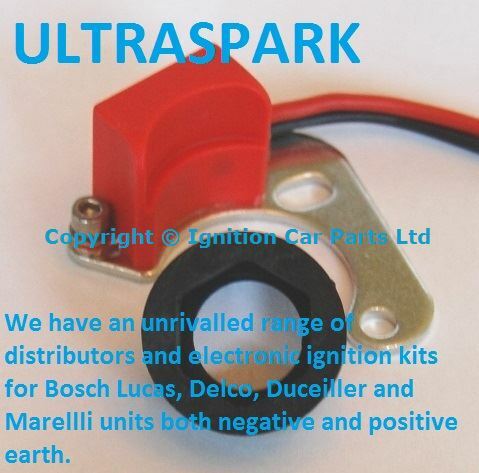 Easy to fit often only taking 5 minutes, no holes to drill, no complicated wiring, no need to get spark gap or dwell correct as this is automatic and best of all nothing bolted to the outside of the distributor. 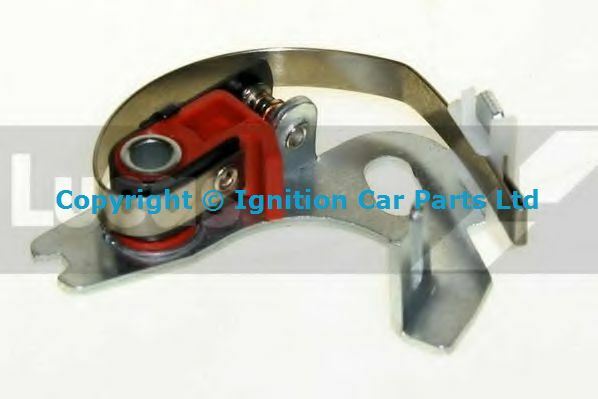 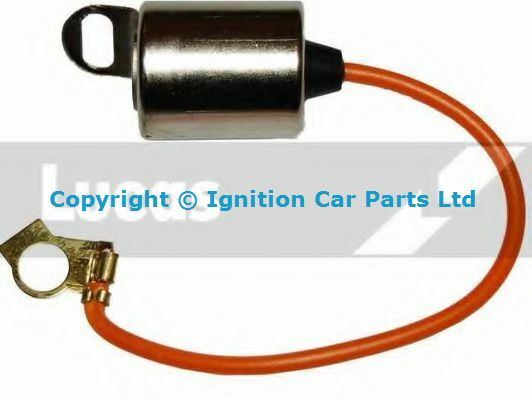 These smaller than a match box units fit inside the distributor in the same place as the points, just 2 wires come out from the distributor to the ignition coil. 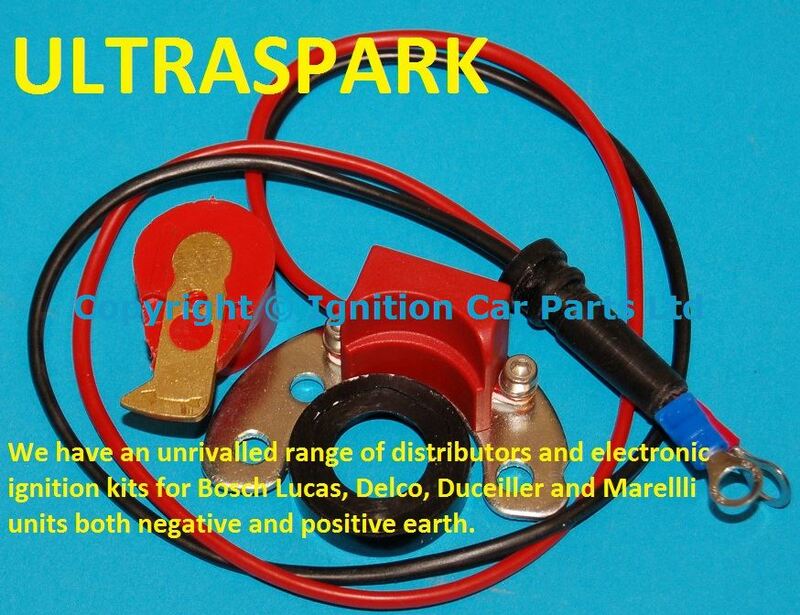 - For Lucas 45D6 Distributors With positive earth,Please note the 45D6 was never fitted to any car with positve earth but some cars were fitted with this type as a direct replacement for the 25D6 and DM6 distributors please cheack your distributor before ordering, The Kit; This easy to fit system can transform any classic into a reliable everyday mode of transport. 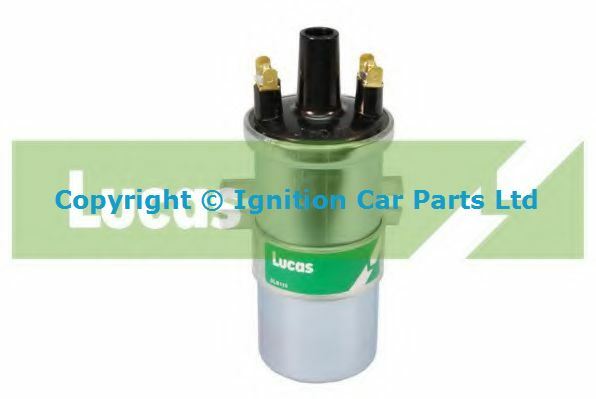 Not affected by damp conditions, better fuel Economy, better starting. 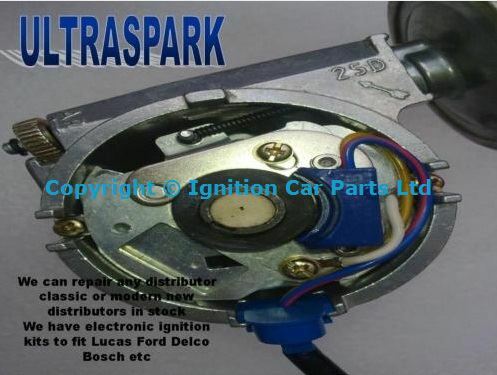 Easy to fit often only taking 5 minutes, no holes to drill, no complicated wiring, no need to get spark gap or dwell correct as this is automatic and best of all nothing bolted to the outside of the distributor. 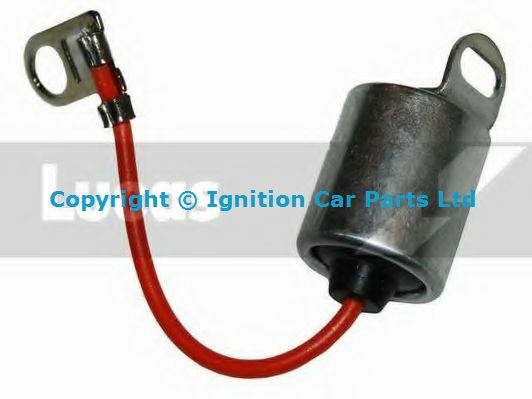 These smaller than a match box units fit inside the distributor in the same place as the points, just 2 wires come out from the distributor to the ignition coil. 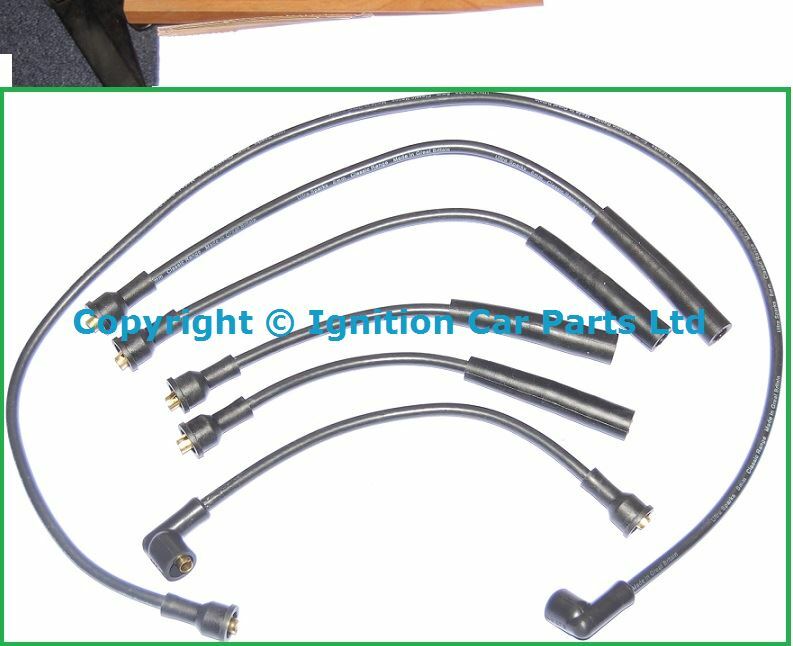 Made in England Classic Black silicone top quality leads all the leads are numbed for easy identification, a real must for your classic car. 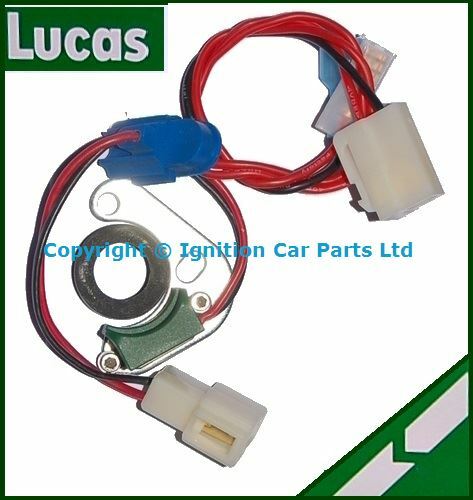 Made in England Classic Blue silicone top quality leads all the leads are numbed for easy identification, a real must for your classic car. 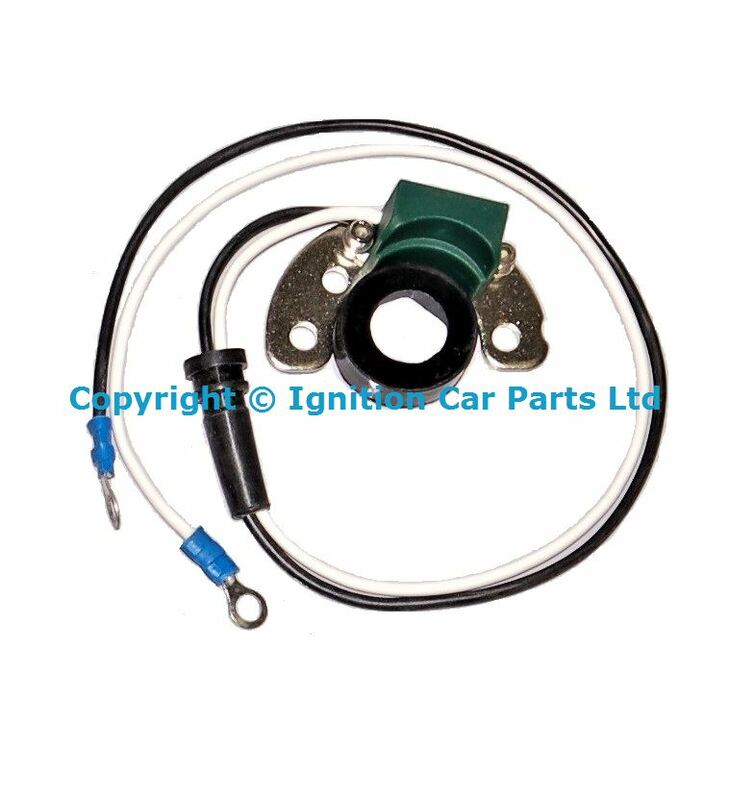 Made in England Classic Dark Green silicone top quality leads all the leads are numbed for easy identification, a real must for your classic car. 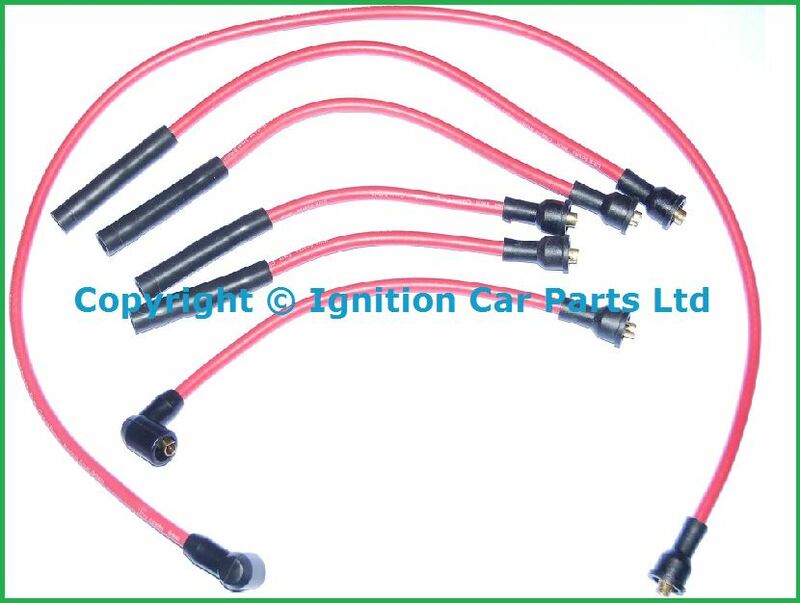 Made in England Classic Red silicone top quality leads all the leads are numbed for easy identification, a real must for your classic car. 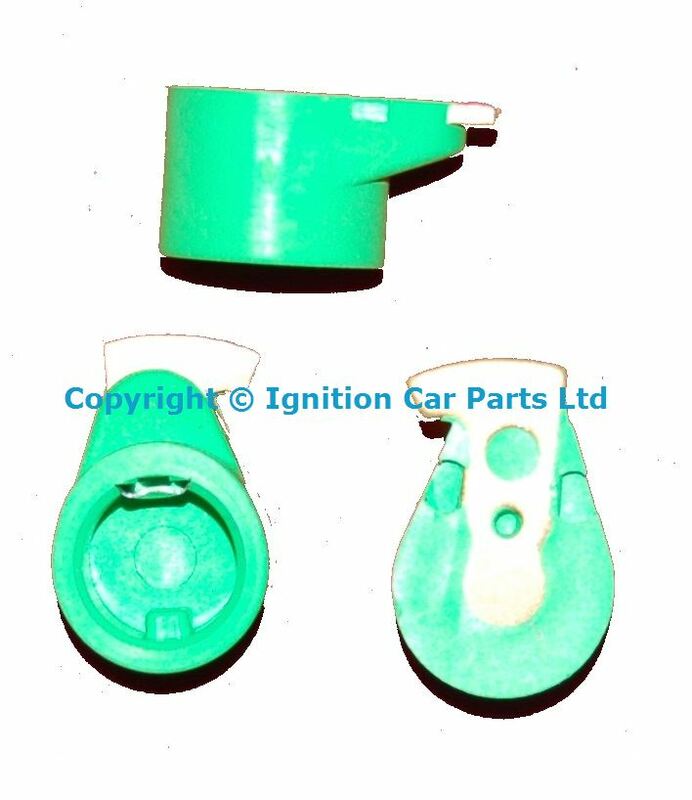 Made in England Classic Yellow silicone top quality leads all the leads are numbed for easy identification, a real must for your classic car. 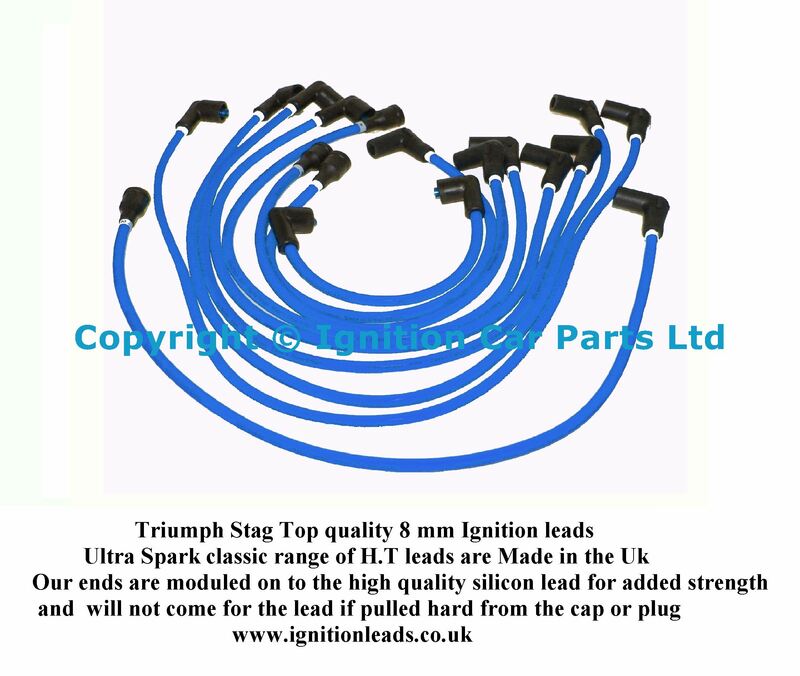 Top quality Triumph Stag ignition leads Blue made in England to fit Triumph Stag Mk I, Mk II and Mk III 3.0l V8, all our leads have molded ends unlike the cheaper copies, our leads are made in England for top quality 8 mm Maglite leads for top performance, but still looking as original, a must for all British made classic cars. 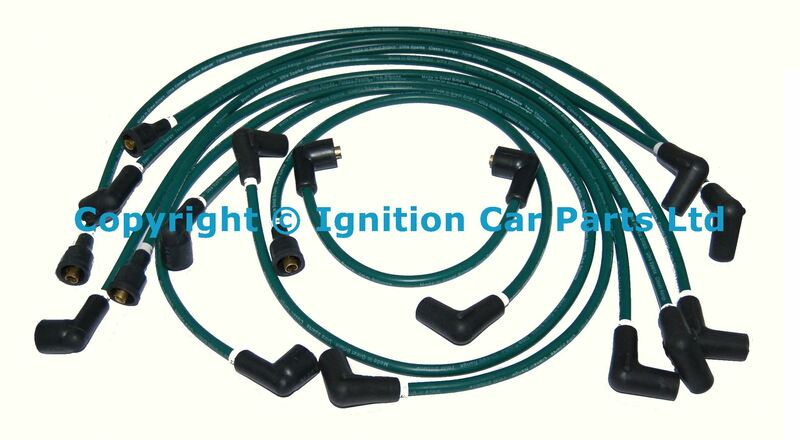 Top quality Triumph Stag ignition leads Dark Green made in England to fit Triumph Stag Mk I, Mk II and Mk III 3.0l V8, all our leads have molded ends unlike the cheaper copies, our leads are made in England for top quality 7 mm Maglite leads for top performance, but still looking as original, a must for all British made classic cars. 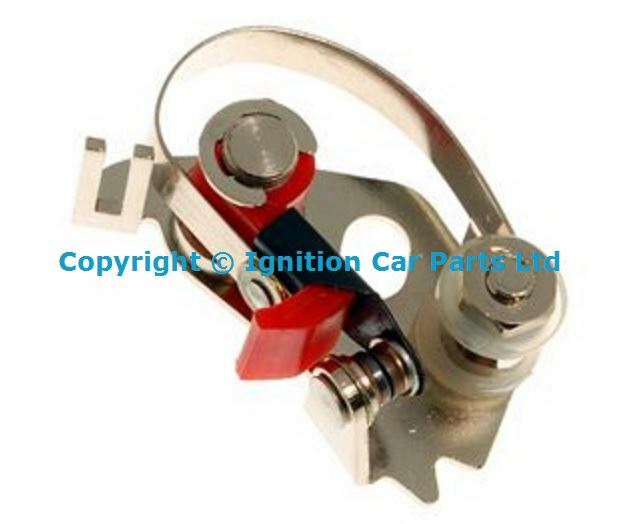 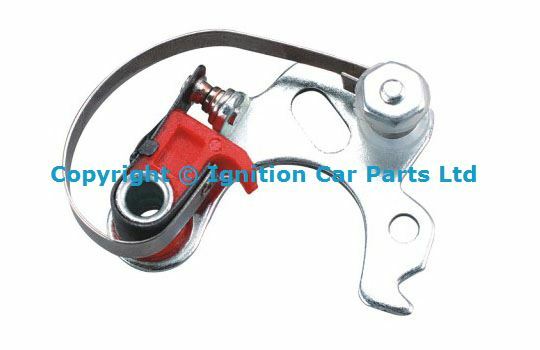 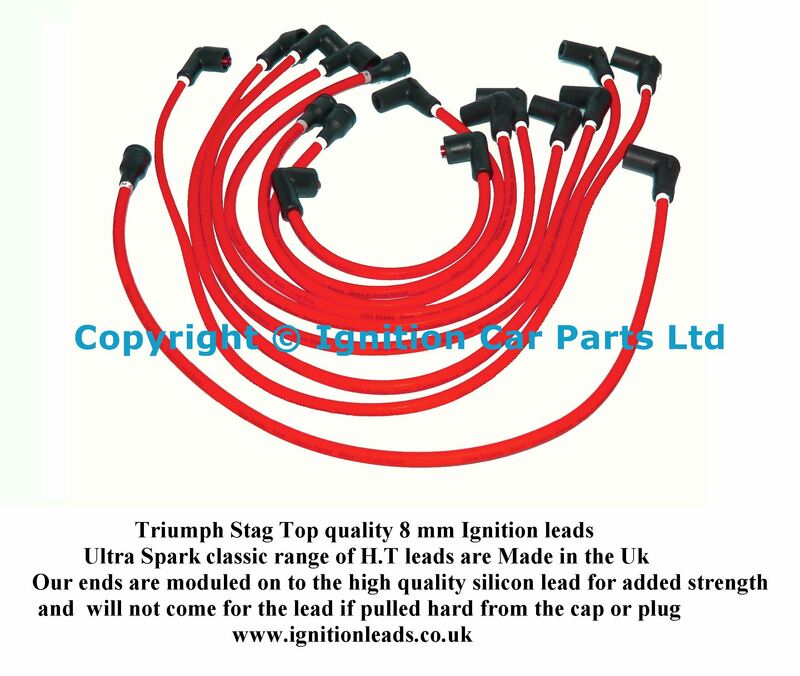 Top quality Triumph Stag ignition leads Red made in England to fit Triumph Stag Mk I, Mk II and Mk III 3.0l V8, all our leads have molded ends unlike the cheaper copies, our leads are made in England for top quality 8 mm Maglite leads for top performance, but still looking as original, a must for all British made classic cars. 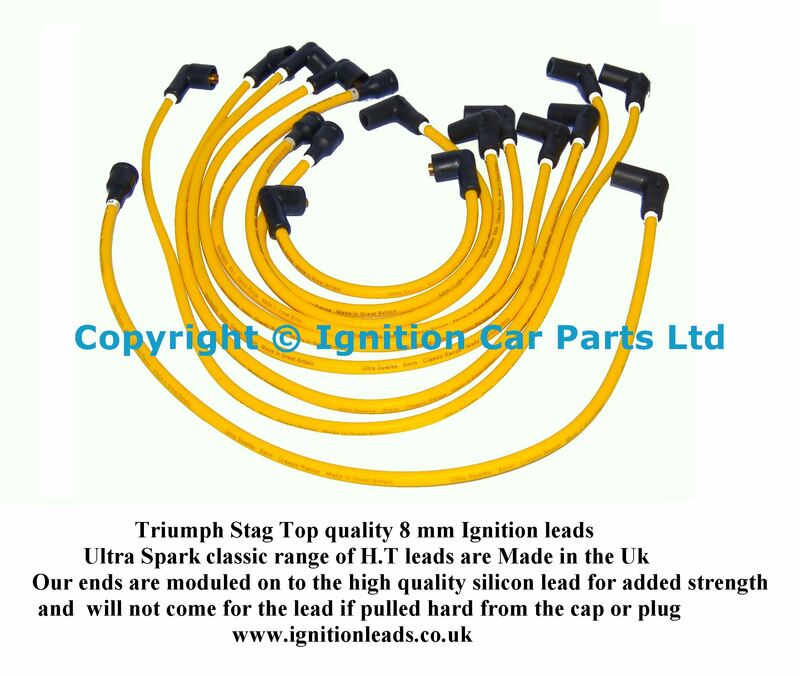 Top quality Triumph Stag ignition leads Yellow made in England to fit Triumph Stag Mk I, Mk II and Mk III 3.0l V8, all our leads have molded ends unlike the cheaper copies, our leads are made in England for top quality 8 mm Maglite leads for top performance, but still looking as original, a must for all British made classic cars. 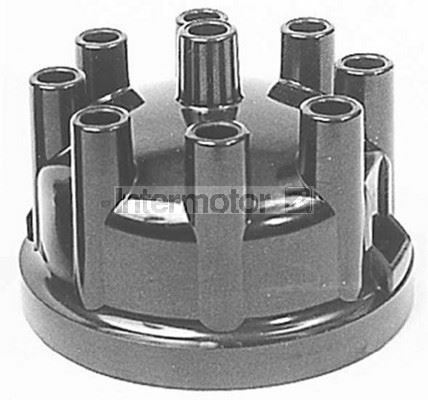 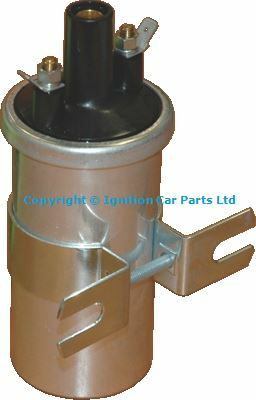 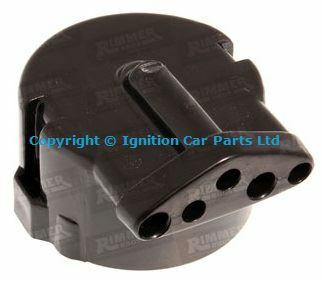 New Top quality ignition coil to replace oil filled coils with ballast. 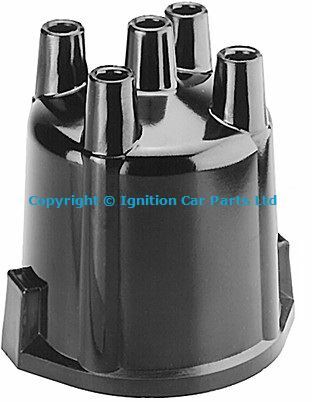 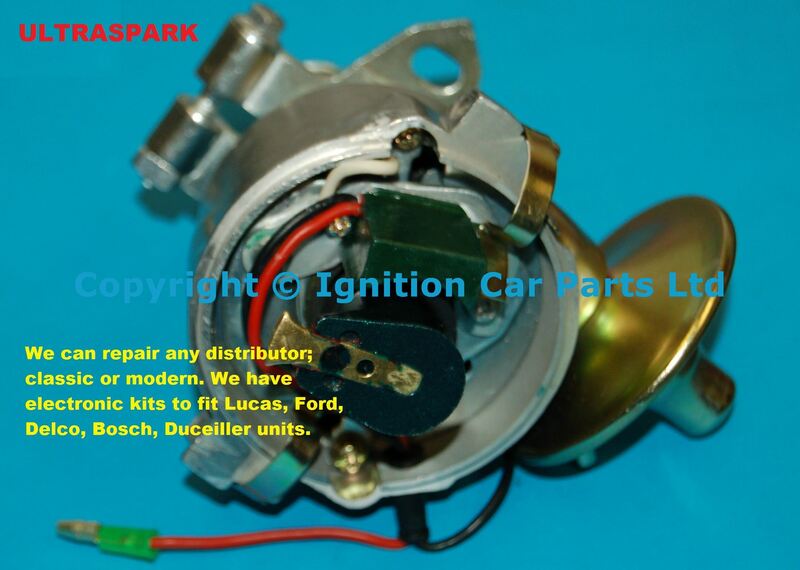 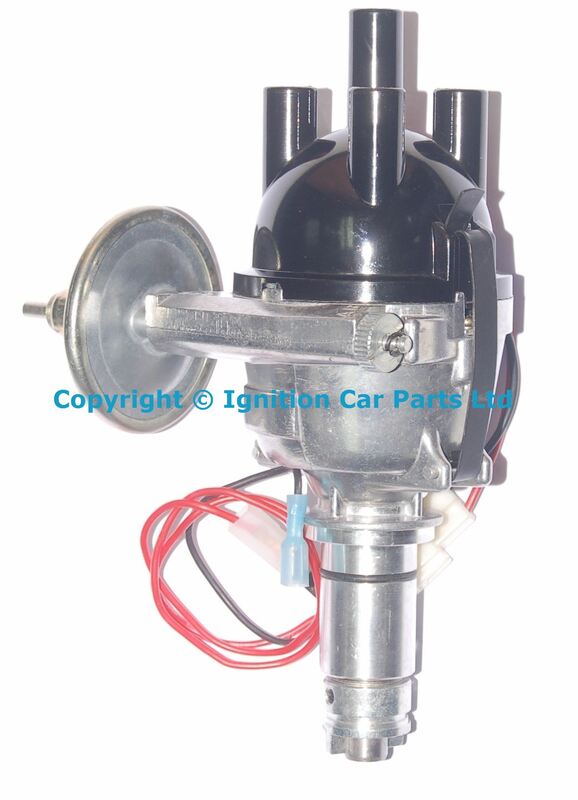 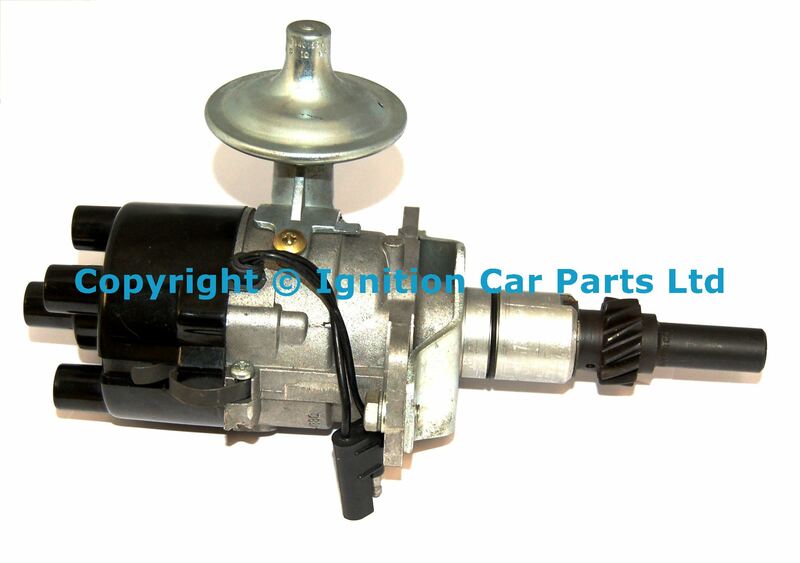 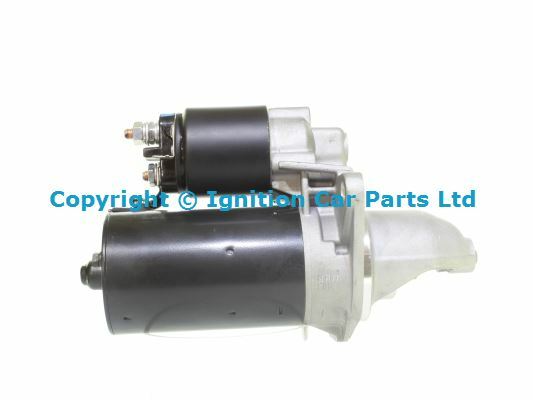 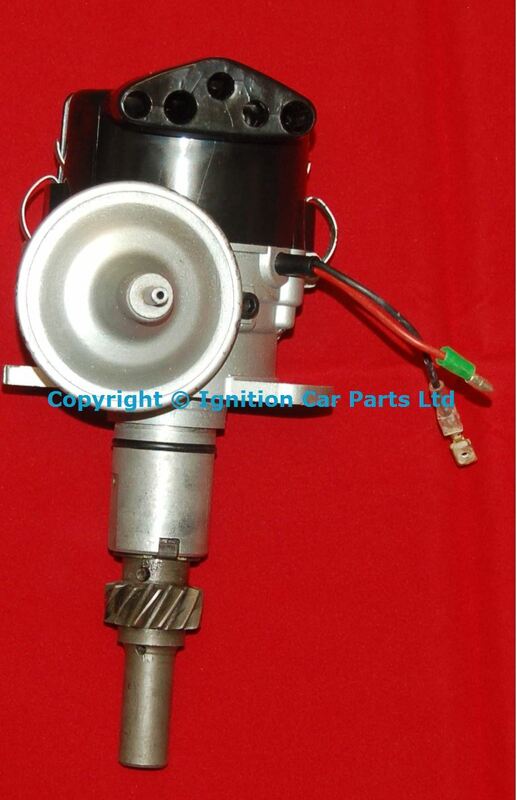 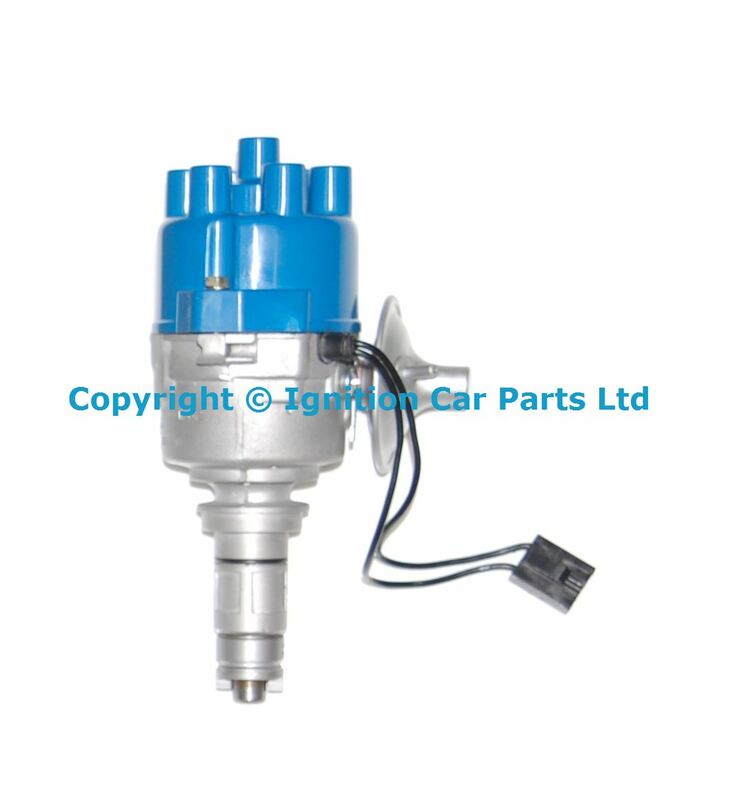 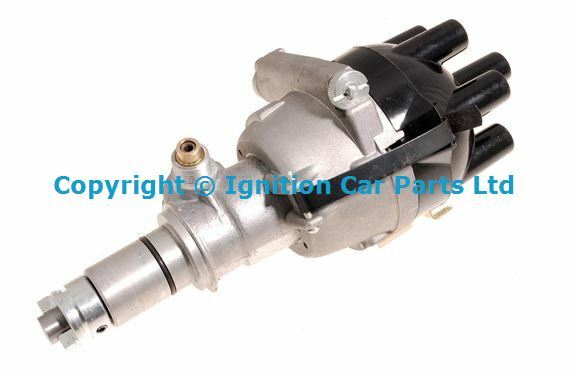 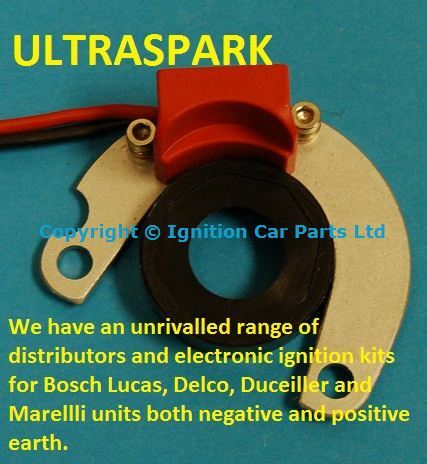 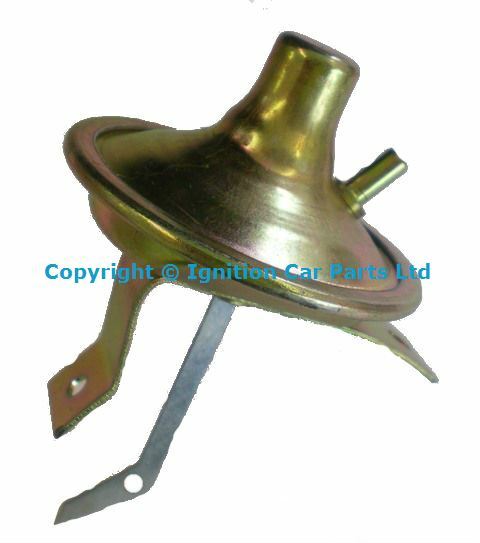 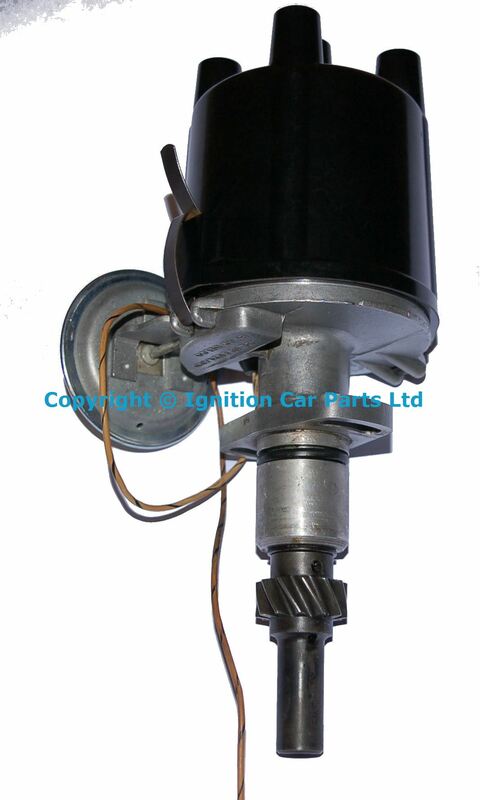 Please send in for reconditioning,we can convert this distributor to electronic ignition please contact us for details. 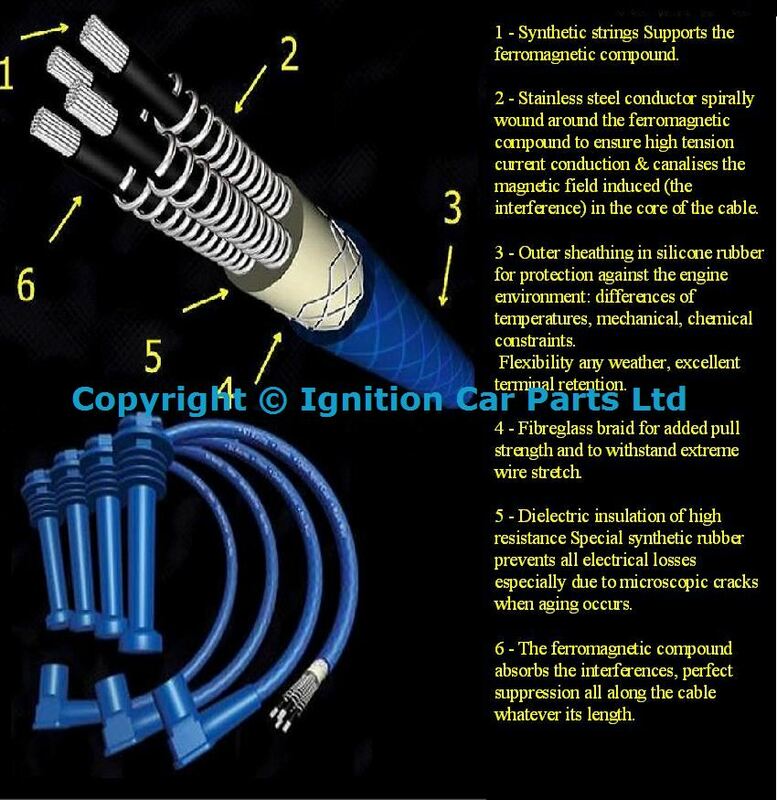 Please Check Part Numbers Before Ordering. 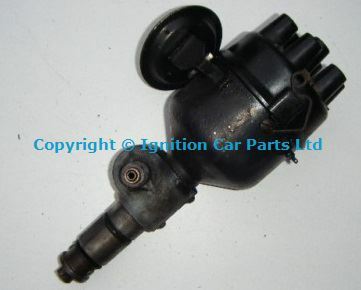 Please phone before you order this part, we may have this unit in stock, if none in stock we can recondition your own unit.